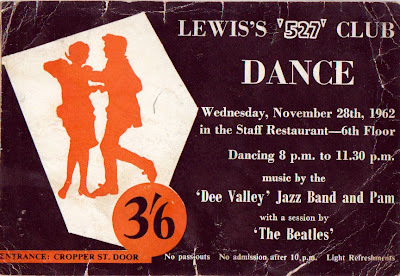 On the evening of 28th November 1962 the Beatles played an evening session in the Cavern and then rounded the night off by playing the staff dance at Lewis's Department Store. The dance was held on the 6th floor of the famous Lewis's building on Lime Street with the venue being renamed the "527" Club for the night. As well as a session by the Beatles, music was provided by the Dee Valley Jazz Band and Pam. It seems that tickets for this event were either collected or torn in two on entry, so finding a complete ticket for this local Liverpool show is extremely rare. In fact the first we have ever seen is up for sale in our auction in August this year. The ticket is already generating a buzz among experts, even the author Mark Lewisohn hadn't seen a complete ticket before now,and several notable Beatles ticket collectors are very interested in this item. Plus we are very excited to have something that so many people haven't seen before in our sale. The annual Liverpool Beatles Auction organised by The Beatles Shop on Mathew Street will be held at the Paul McCartney Auditorium at the Liverpool Institute for the Performing Arts on Saturday 24th August 2013. For any questions about items in the auction or values of Beatles items you may have please see our contact page.